They say that opposites attract each other. People enter into relationships with someone that has a different character to their own. Perhaps we do this because we are so familiar with our own ways but recognise that something is missing, so we look for someone with other characteristics that may provide us with the thing we lack. So many relationships reflect this astrologically. Many people are drawn to partners with the Sun in quite different signs, there may even be oppositions or square aspects between them. The same would apply to other planets. Astrologers would often say that the more aspects between the two people the better, irrespective or whether they are easy or difficult. Relationships do challenge us to grow as well as providing us with harmony. But what would an astrologer say if someone wanted to marry another person with an almost identical chart to them ? Does this mean that they are looking for an easy life without challenges ? Or does it mean that they are so tied to a particular experience of fate that their choice of partner has to reinforce it ? In the case of Carol and Michael Damon, its definitely the latter. How do we know ? Well for starters they were both Scorpios and this is a sign that never looks for the simple easy option in life. 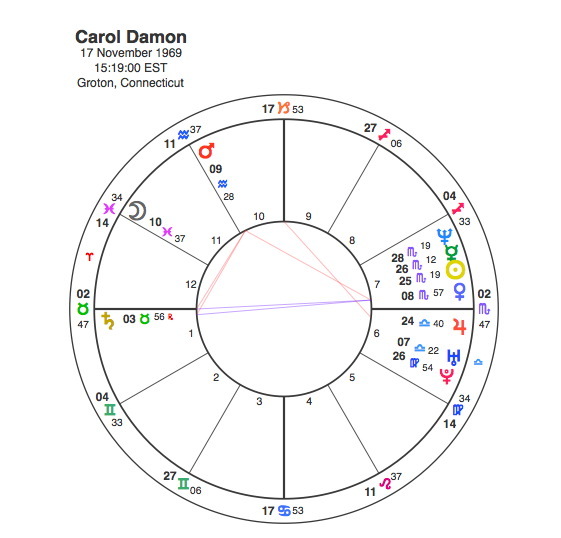 Carol Damon has 4 planets in Scorpio including a Sun, Mercury, Neptune conjunction. This grouping is in the 7th house, and if there is any certainty at all in life you can bet that someone with this collection in this house is not going to have a simple easy married life. Carol was obviously a deeply emotional and sensitive person, a fact reinforced by the Moon being in Pisces. The natural intensity of her love life would be compounded by Venus also being in Scorpio conjunct the 7th house cusp. Another thing we can say with a fair degree of confidence is that with all this 7th house focus, Carol Damon is likely to be someone whose life is dominated by her choice of partners. Unfortunately Venus’ aspects show a great deal of suffering is likely to be involved. Venus is opposite Saturn. Saturn is the principle of restraint and limitation. When Venus is conjunct Saturn, the individual tends to carry with them a certain inhibition when it comes to the expression of feeling and attraction. When Venus is opposite Saturn, the restraint comes from someone else. So Carol’s own wish to express her deeply passionate nature will be restrained and suppressed by someone else. As this opposition is from the 7th to the 1st house, the person holding her back will undoubtedly be her husband. Its important to note that Saturn is very close to her Ascendant, so the impact of this restraint will be very powerful indeed and have a huge impact on Carol’s self expression and ability to lead her life generally. The other problem is that this opposition focuses by T Square onto an apex Mars. Capricorn Research is strongly of the opinion that whilst the Sun, Moon and Ascendant are generally a very good judge of the individual’s character, there is no clearer picture of the direction that a person’s life will go in than that of the apex planet of a T Square if they have one. Indeed this website is full of articles that clearly demonstrate this principle. So an apex Mars, being the focus of Venus Scorpio in the 7th opposite to Saturn shows that Carol is likely to be on the receiving end of domestic violence. Given this scenario, if Carol came to an astrologer with the chart of her intended, what advice might be given if that chart looked like this ? 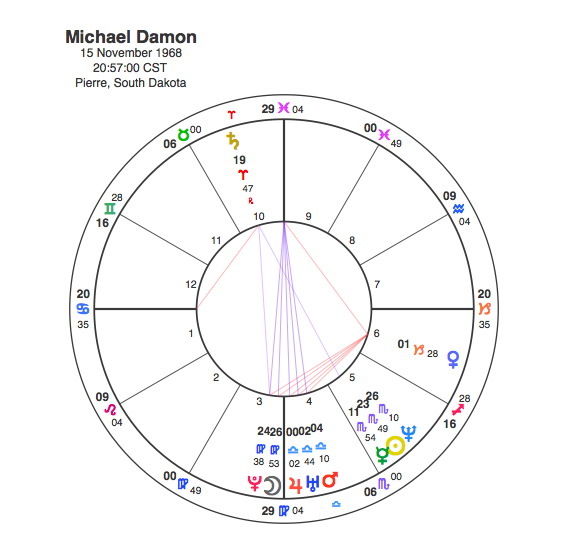 Michael Damon was born almost a year before Carol and as such has a number of planets in very similar positions. He also has the Sun / Neptune conjunction in almost the same degrees of Scorpio with Mercury in the sign as well. Jupiter, Uranus and Pluto are in very similar positions as well. There are obviously some differences. They were born at different times of day so Michael’s Scorpio planets are in the 5th house rather than the 7th. But the 5th house is also to do with affairs of the heart. Michael’s Moon is in Virgo in a very close conjunction with Pluto right at the base of the chart. It is hard to imagine a deeper and more intense combination than the Sun in Scorpio with the Moon conjunct Pluto at the base of the chart. Its also interesting to note that this Moon / Pluto conjunction is square to his Venus. In fact if we include his Midheaven in the equation we have a T square that focuses onto an apex Venus in Capricorn. This would indicate someone who struggles to express the intense feelings that he has in any kind of constructive way. Intense jealousy is likely to go with the territory. With an apex Venus in Capricorn, we should expect him to express his own version of love in a rather harsh way. One other particularly significant factor is the position of Saturn. Saturn is the only planet in the upper half of the chart, in fact it forms the handle to the bucket like shape. This makes it much more powerful than would otherwise be the case. The other thing is that by making two inconjunct aspects to his Sun and Pluto we have a Finger of God / Fate formation. This formation has a natural connection with the 6th and 8th houses and is often linked with health or death. Saturn is also closely square to his Ascendant. This means that it is also square his 7th house cusp. If Carol had come to me with her own chart and that of the person she wished to marry in 1989, I would have been seriously alarmed. That their Suns are so close meant that their fates were intertwined anyway but it does look as if she might be in serious danger from this relationship. I would have been particularly worried about Pluto coming to conjunct their Suns in 1992 – 3. And I would have been almost right. Here’s her story. Carol and Michael married in May 1989 after a year together. In less than a year the intensity and frequency of their arguments escalated and she left him early May 1990. She took a job as an exotic dancer. He did not want her to do exotic dancing, however they had started dating again in August 1990. He visited her at her apartment in September to talk about their future, and they made love. When they concluded, he knocked her unconscious and smothered her to death with a pillow. It was not premeditated. He then left, broke into a shop to steal a gun and went back to the apartment, where he shot himself to death. Police found them lying side by side on the bed. The did not even get as far as the Pluto / Suns transit. The reason for that was in September 1990, Saturn was conjunct Michael’s 7th house cusp and square its own position triggering the threat from the Finger of Fate in the very specific direction of his wife Carol. Ironically Michael Damon had been studying serious astrology. Whether this helped give him any useful insights into his own situation or not we shall never know. Maybe it would have been better if Carol had been doing the studying, she might have seen the warning signs. On the other hand, this whole situation seemed to be dominated by that Finger of Fate, so perhaps it was all tragically unavoidable.